Band-Aids. Movies. Color television. Bubble Wrap. Bar codes. The modern submarine. What do all of these things have in common? Give up? They were all invented in the great state of New Jersey! New Jersey is truly the land of inventions. M&M’s, solar panels, transistors, flexible film and Graham crackers are but a few of the useful and unique creations from the minds of Garden State residents. Not to mention the 1,093 patents issued to Thomas Alva Edison. Learn about the many inventions and innovations that came from the minds of Garden State people. Linda Barth is Executive Director and Newsletter Editor for the League of Historical Societies of New Jersey. 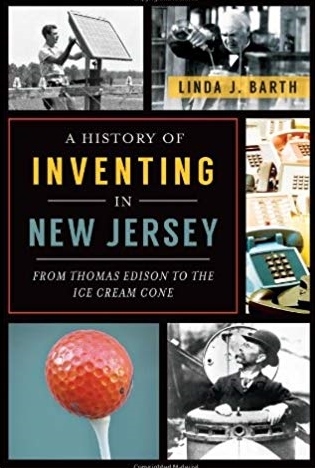 She is the author of A History of Inventing in New Jersey: From Thomas Edison to the Ice Cream Cone, published by the History Press. Ms. Barth has also published histories of The Delaware and Raritan Canal and the Millstone Valley, and 2 childrens’ books, Bridgetender’s Boy and Hidden New Jersey. She is a contributor to the Encyclopedia of New Jersey, and a frequent traveler and travel writer.